Windows 7 with help from manufacturers who want us to buy new products every few years have successfully ended the practical existence of our printer. Our beloved HP Deskjet 855C. 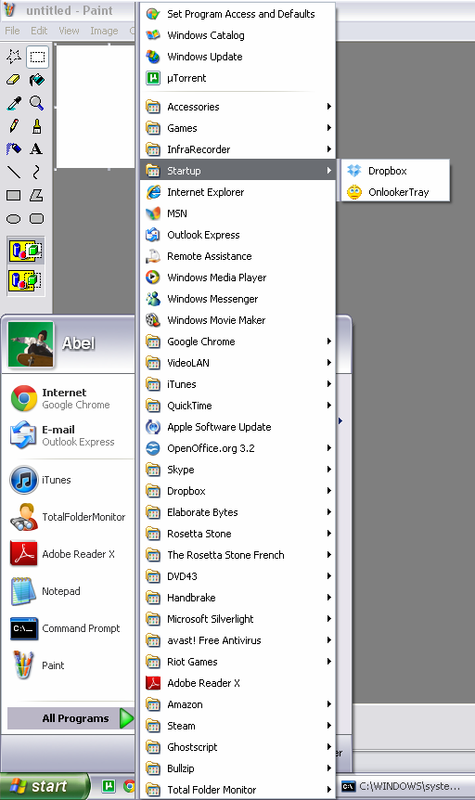 We just upgraded from Windows XP on my father's computer to Windows 7 64bit. All has been wonderful except a few things: Printer and Scanner. Of course you can just buy a new printer and scanner if you have 200$ laying around, but who wouldn't rather spend that money on food or college education? After researching our problem we realized we had a few problems. Multiplicity is amazing. We bought a parallel to USB connector then realized that Windows 7 didn't support our printer. Crap! Later we decided to simply hook it up to another network printer running Windows XP. Crap! You still have to install the drivers and they don't have them for Windows 7. --One involves using printing to .ps (Postscript) files, and forwarding them to a postscript compatible printer and life is easy. Mine didn't work out brilliantly. --You can print to .ps then convert to .pdf and then print that file via command line! Easy! Just a batch script and voila! Problem: You can't command line print to a non LPT printer, that is, you can't command line print to USB printers without spending $ on software. 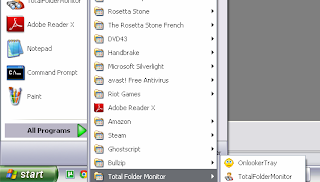 --Finally I used Bullzip PDF Printer, in conjunction with a program called Total Folder Monitor and I will outline the steps so you can enjoy this as well. 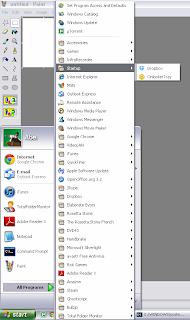 You need a computer on your network that DOES support your printer, some Windows XP machine will probably work. 1. 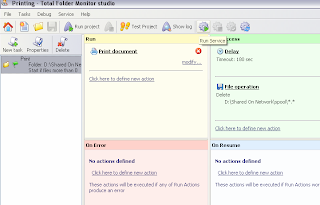 Install Total Folder Monitor and create a network shared folder that the machine you want to print from can see. 2. Tell Total Folder Monitor to print *.pdf (from your shared network folder, from step 1) to your default printer. 3. After the file is printed (On Success): I chose to delete *. * from the shared directory. You must delete the file after more than 0 seconds or it will disappear too quickly to print. Why not delete it 2 minutes after completion? Sounds great. 4. You must also save the task and tell it to run as a service; I added the program (onlooker tray) to the startup folder in windows so it runs on boot. 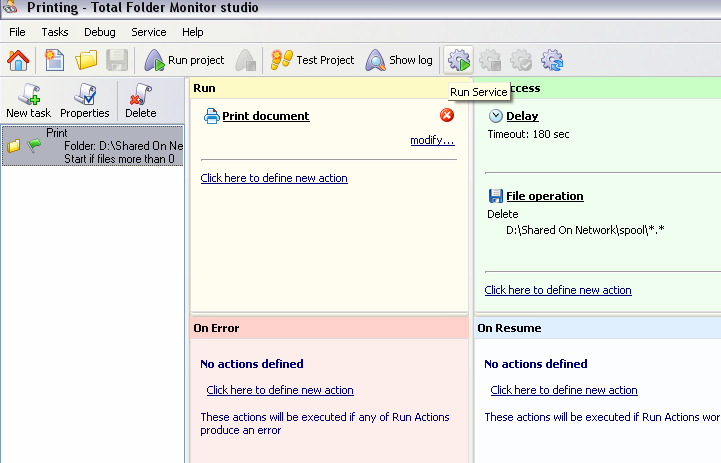 Step 2: Setting up Total Folder Monitor. After Setting up, click 'Run Service'. (Step 4). Step 4: Add to Start Up Folder. 5. Install Bullzip PDF printer. When you print, just like normal you click print, after you will be shown a save file dialog box. Safe the file on the network share (The one you set up to print *.pdf files from earlier) and press save. The filename doesn't matter as long as it is *.pdf where * means anything. Also, make sure you're saving as .pdf and not another format when printing with BullzipPDF. 6. After you've saved the file successfully on the network drive it should open and print on the other computer and delete the file after 2-3 minutes. Pros: Honestly, very easy to do, no command line stuff necessary. --I don't know if the program is really free. Bullzip is free, but the other might expire in 2 weeks and I'll be screwed. --Also, you are not able to change your printing settings on the fly without physically visiting the computer that has the printer attached. --Can this work with 10 people printing to same directory? What happens if you print twice, but 175 seconds after the first and it gets deleted prior to being printed? Conclusion: Not a bad solution. We bought a new printer 2 days later anyway, but I still feel that I won. That's all that matters. Wow, you went through a lot. I was lucky enough to have a simple thing and only have to click some extra buttons to change to software for 7 o_o.. But that.. was a simple printer.. and also not mine so, for all I know maybe it didn't work.. heh. Well, it probably was time for a new one anyway. I would have just got a new printer. You're much more persistent than me. You know, it must have been my love for that printer that led me to go to such drastic measures to NOT part with it. Or, it might have been a financial problem.